I found this recipe scrolling through Pinterest late one evening. 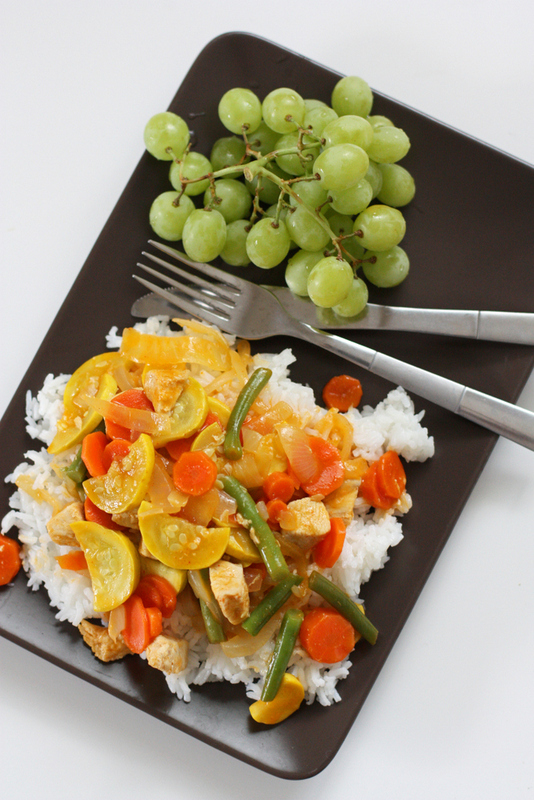 The picture is what first lured me in, but after reading through the recipe and seeing how easy it looked, I decided to give Janssen’s Easy Thai Curry recipe a go! Great news: It IS simple, it’s delicious, and it makes great leftovers! One of my favorite aspects of this dish is that you can use whatever vegetables you have on hand, or can find in season. I used to follow the recipe exactly, but have since just used up the things I have in my refrigerator already, or shop the sales. The zucchini, squash and green beans that it calls for are all good, but I have added brussel sprouts, and even asparagus when I’ve had it on hand. My other favorite hack for this recipe is to use shredded rotisserie chicken instead of cooking it from raw. If you have leftovers from a chicken, this recipe is a GREAT way to use them up! 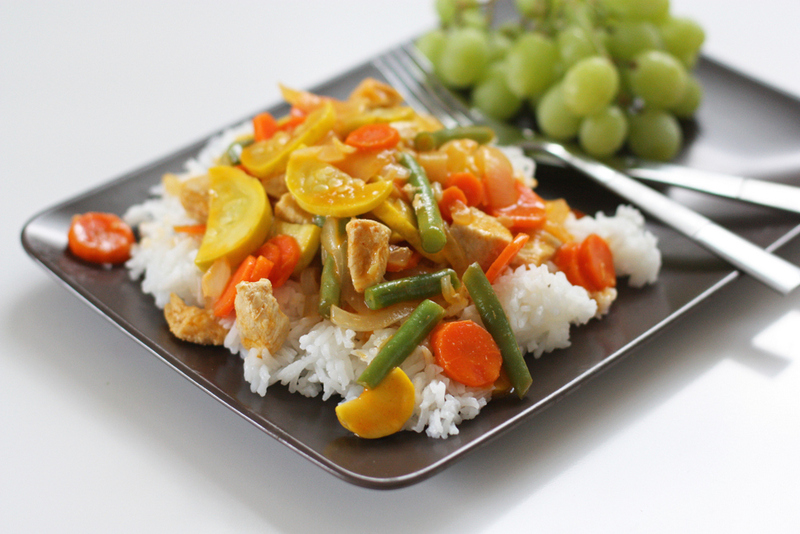 Once you get the rice cooker going, this is a one dish wonder! I use a large frying pan, or preferably a wok. It’s best to get all your veggies cut bite size at the beginning, because once you start cooking things go quickly! I love using carrots cut in rounds, and that is the only veggie I do precook a bit in the microwave just to give them a head start so they’re definitely cooked once the dish is done. Get your pan heating, and add some oil and the onion first. Then add the hardest veggies first- I leave the bell peppers and squash until the end. Add your chicken and season the whole dish quite generously with salt and pepper. Now, stir in the curry paste, more if you like more flavor and heat! The 1.5 Tablespoons it calls for makes the dish flavorful, but not at all spicy, so don’t be afraid to add that much! Finally, add the coconut milk, broth and fish sauce. Let simmer until the vegetables are cooked as soft as you’d like them. After I made this dish the first time, I’ve been able to make it again and again without shopping for all the ingredients. Just get a large jar or red curry paste and fish sauce, then you only really need to shop for the fresh produce and coconut milk! I usually keep chicken broth in my pantry, but if I’m unexpectedly out then I just use water and add a chicken bouillon cube instead. Works like a charm! Hope you enjoy this Pinterest find as much as I do!